Casa Maresia is a charming two-story independent house which faces the sun and the sea. It sleeps four people. 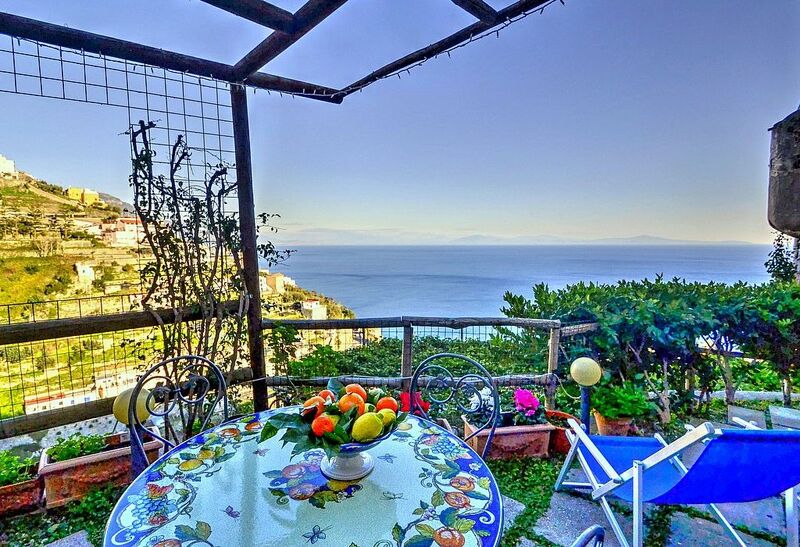 From Casa Maresia you will enjoy a gorgeous view of the sea and of the coast of Amalfi. Casa Maresia is 50 square meters (540 square feet). It features a private terrace with a view of the sea, air conditioning (please read description below to check in which rooms the units are installed), winter heating and WI-FI Internet access. You will be roughly 3 km (1.8 miles) from Amalfi, where you will find restaurants, shops, public transportation, the beach and the tourist port. You will find the closest restaurantat 600 meters (660 yards), a grocery store at 300 meters (990 feet), the stop for the SITA bus Amalfi - Tovere line a few meters (feet) away and the closest beach at roughly 1 km (0.6 miles) including 400 stairway steps. You will reach Casa Maresia from the street level going down a 20-meters (65-feet) public walkway that includes approximately 22 stairway steps. You will not need a car to stay at Casa Maresia. If you do have one, you will be able to park it nearby, free of charge in a reserved parking space. The parking space is suitable for small car (the size of a Fiat Punto or smaller). The terrace is 20 square meters (215 square feet) large. It is partly shaded by a characteristic pergola with a bamboo roof. It is equipped with a table, chairs and two deck chairs. Here you will also find a portable barbecue. From the terrace you will enjoy a fascinating view of the sea and of the coast of Amalfi. The ceiling of the living room has characteristic exposed wood beams. The furnishings are warm and welcoming. The furnishings include a divan that unfolds into a double bed. In the living room you will also find a cooking area. The kitchenette is equipped with a five-burner gas cooker, an electric oven, a small refrigerator with freezer, an Italian-style coffee-maker, a toaster and other small appliances. The dining table can accommodate four guests. In this room you will find a flat-screen satellite television (local channels). From the living room you will be able to enter the terrace with a view of the sea and of the coast of Amalfi through a French door. The room is equipped with an air conditioning/heating unit. The bathroom is tiled with lucid handmade majolica tiles and equipped with a washbasin, a toilet and a shower. You will be able to enter the bathroom from the living room. You will be able to enter the bedroom from the living room climbing 13 steps. This room has no door. The ceiling is vaulted. The room has a matrimonial bed (160 cm/62 inches, wider than a queen-size bed). The room has a small high window with a view of the greenery. My wife and I greatly enjoyed Casa Maresia. The accommodation was very comfortable, the setting is jaw dropping and we frequently stared out the windows at the views. The neighborhood proved much of our needs in terms of food. We felt privileged to be in a local community. Summer In Italy appears to be well organized. I will recommend them. Relaxing but interesting stay with jaw dropping views everywhere. Unique and unspoiled location away from the crowds of Amalfi with a lovely view from the patio. Hostess was excellent. She picked us up at our bus stop, drove us to Potsitano on her way to work one day and drove us to Central Amalfi on our departure date. Casa Maresia is fantastic! The property is well-kept and in a great location. The view from the terrace is amazing. The parking space was a real surprise and much appreciated. I would definitely stay here again. The hosts are very friendly and helpful. I found Summer In Italy on line when looking for properties in the area. The communication was efficient and clear. Very satisfied with my experience. We absolutely loved our time there. Our stay was incredible we wouldn't change a thing. Our host was amazing and took the time to answer any of our questions. She went above and beyond and made our stay pleasant. Your setup was easy to book we will definitely use Summer In Italy in the future. Casa Maresia is a great place to stay in Amalfi. The house is extremely clean and comfortable. It is located at about 2 km from downtown Amalfi, but there is good public transportation so this is not a problem. The owner, Rachele, makes sure to explain every detail you need to know for your stay. I definitely recommend Casa Maresia, it is a top ten place to be and you will get an awesome view of the Amalfi Coast. The rental price includes: electricity; linens; towels.Available upon request: baby bed. To be paid at the property:cleaning EUR 50.00 per week.